‘SCENES’ exhibition: May 24 – July 6, 2013. Questions asked by Magdalena Kröner. 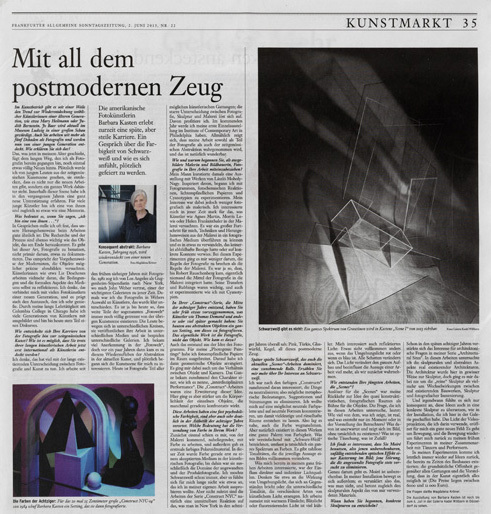 The American photo-artist Barbara Kasten is currently experiencing a late but stellar career. A conversation on the chromaticity of black and white and how it feels to suddenly be celebrated. There has been a trend in the art world for quite a while toward rediscovering female artists from an older generation, for example, Mary Heilmann or Judith Bernstein. A major show is currently paying tribute to Jo Baer at the Museum Ludwig. You have also been working as a photographer for more than five decades and are now being discovered by a young generation. How do you explain that? What is happening right now at my age adds something completely new to the long path I have taken as a photographer. I am suddenly perceived by young people from the contemporary art scene, they discover that there are not only my new works but an entire oeuvre behind them. In the past years, I have experienced a really new kind of support from within this scene. For many young artists, I am one of them and at the same time something like a mentor. What does it mean to say, “I am one of them…”? Deschenes are working more on reflecting the conditions and the formal aspects of the medium itself. I think that is what connects me to many photo-artists of the new generation, and it also shapes the exchange with them, which I enjoy very much. In my years of teaching at the Columbia College in Chicago, I have trained many generations of artists and participate in a discourse until today. How did your career evolve from photography to contemporary art? How is it possible that despite your long artistic career you have now been discovered as an artist internationally? I think that has a lot to do with the distinction between photography and art which persisted for quite some time. I have been working with photography since the early 1970s. In 1982 I moved from Los Angeles to New York as a Guggenheim scholarship holder, where I was represented by John Weber, one of the most important gallerists at the time. I was Weber’s photographer among his selection of artists, that was a clear distinction made in those days. It is the case until today that broad sections of the so-called “world of photography” still exist totally separated from the art scene: People socialize in different circles, they publish their work in different media and exhibit in different galleries. I was highly recognized in the “world of photography,” but a few years ago, a revival of abstraction arose in contemporary art, and the art scene suddenly became interested in me. Today, photography is a part of all kinds of art genres; the rigid differentiation between photography, sculpture and painting is dissolving. I benefit from that. Next year, I will present my first solo show at the Institute of Contemporary Art in Philadelphia. It is gradually becoming clear that my work is being perceived as both a part of photography and of contemporary abstraction, and that is, of course, wonderful. How and why did you, as a trained painter and sculptor, start integrating photography into your work? At the time, may husband curated a show displaying works by László Moholy-Nagy. That inspired me to experiment with photograms, photochemical reactions, photosensitive paper and cyanotypes. However, my interest was less of a photographical than painterly nature. In those days, I was very interested in what artists such as Agnes Martin, Morris Lewis or Helen Frankenthaler endeavored in painting. For me, it was a great progress to be able to apply techniques and methods of painting to a photographic medium and transform them to something that had no reproductive references to specific contexts whatsoever. With these experiments, I was less concerned with breaking the rules of photography than breaking those of painting. It was indeed the case that – until Robert Rauschenberg – no one had integrated the means of photography into painting. His transfers and rubbings were important, and he also experimented with cyanotypes, like I did. In your “Construct” series, produced in the mid-1980s, you, at a very early stage, anticipated what artists such as Thomas Demand and others created much later: You used abstract objects to build entire settings and then photographed them. The actual work is the photography and not the object. How did this come about? That also resulted from the idea of the photogram. For my “Photogenic Paintings,” I spread out photosensitive paper in the room. I then arranged geometrical objects on it. I was concerned with the relationship between object and camera. All this took on the character of, as I would call it, an “interdisciplinary performance.” The “Construct” pieces expanded this idea. But in this case it was more about the corporeality of the individual objects that at times made an all but confrontational impression. These works reveal an almost psychedelic coloring, although they are distinctly situated in the aesthetic of the 1980s. What significance does the use of color have in your work? First of all, coming from painting, it suggested itself to work with color, and apart from that, colored Polaroid material had become available for the first time. During this time, color just started to be an accepted medium in art photography; until then, it had belonged exclusively to the domain of applied and product photography. I always liked black and white, but for a long time I didn’t feel as if it was something I wanted to try out in my own work. Yet works of the “Construct NYC” are, of course, a direct reaction to what everyone could see in New York in the 1980s: pink, turquois, glass cubes, cones, all that postmodern stuff. Later on, black and white, which is also dominant the current “Scenes” pieces, played a more important role. Please tell me more about your interest in black and white. After the colored “Constructs,” I was increasingly interested in neutralizing things, meaning to eliminate metaphorical meanings, suggestions and moods. I wanted to concentrate on a range of colors and forms that were as neutral as possible to create ambiguous and puzzling spaces with them. So it suggested itself to also remove the color. But there is, of course, an entire range of colors in these works. What we call “black and white” in a simplifying way actually comprises a whole spectrum of colors. There are numerous tonalities that completely change the respective message of a picture. What already interested me in my very early works was the influence of direct and indirect sources of light. Just think of the effect of ambient light that is refracted on the objects or the different tonalities that different types of artificial light create. I mostly work with warm film light; flash light or fluorescent light is much cooler. I’m also interested in reflected light: Something looks totally different if the ambient light is red or if it’s blue. All shadows change. The light alters the entire construction and influences the message of a work much more than we initially perceive. How did you produce your most recent works, the “Scenes”? What triggered the “Scenes” was my return to the idea of the quasi constructivist, photographic space as a stage for objects. The question I examine in these works is: How much of what I show is real and what emerges only in the moment or in the viewer’s imagination? What is unexpected and shows itself in the picture without actually existing? What is an optical illusion, what is chance? I find it interesting that you use moiré, that incalculable, coincidentally created optical effect of a grid in the picture; the disturbance that applied photography always seeks to eliminate. That’s exactly the point. Moiré is incalculable. In my installation it also moves; it makes what one sees unclear and at the same time stresses the sculptural aspect of the material I use. When did you start creating concrete sculptures? Already in the late 1980s I became more interested in architectural questions in my series “Architectural Sites.” In these pieces I explored the sculptural and abstract aspects of existing architectures. In a certain sense, architecture turned into sculpture here, but my issue was never “pure” sculpture, but instead the interplay between actually existing buildings, sculpture and photographical staging. And at one point it just felt logical to translate these ideas into a concrete sculpture, like in the installation I made here in the gallery. The light of the video projection that I use opens up an entirely new field for me: It is about movement, and movement in turn leads me back to my early experiments working together with dancers and performers. In my experiments, I ultimately always return to ideas that already existed during the time of the Bauhaus: the fundamental openness to all genres and the notion that everything is actually possible in art.